From the roots that anchor a majestic tree to a song by Kings of Leon, "Beneath the Surface" has many connotations. We look into dark water and wonder what lies beneath. We long to understand the meaning of a cryptic statement. What comes to mind when you ponder what is "Beneath the Surface?" 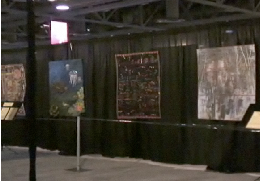 My work -Shaking the Tree of Imagination on right at IQF Long Beach CA and Houston. Recently I, as well as several other artists as Yvonne Porcella, Susie Monday, Jane LaFazio, Gerrie Congdon, and many more are being interviewed on Dinner at Eight Artists blog for the special exhibit "Beneath the Surface" that will be shown at the International Quilt Festival in Long Beach, CA - July 22-25th. The exhibit will be sponsored by Moore's Sewing Centers and Brother International. 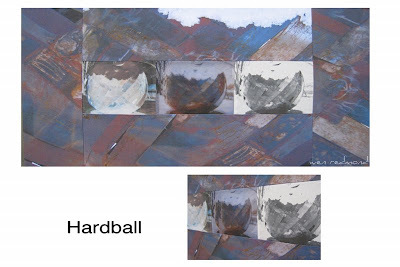 The artists behind the exhibit are Jamie Fingal, an award winning full-time artist who lives in Orange, California. She is the author of “Embellished Mini Quilts. "see Jamie's website and blog. AND Leslie Tucker Jenison is an award-winning textile and mixed-media artist who works primarily on the quilted surface. see Leslie's blog. 2. What is your creative process? planning, drawing, notes, etc. I am a process person. My process is fed by my love of being outdoors. I’m passionate about coming up with ideas and working out the kinks. It speaks to me. Part of that process is photography. I can see the most exquisite scenes or combinations of patterns and want to share that beauty. My art represents these moments. They are what lie beneath. I bring them back to share, to remember, to remind. These moments become my source, my well. This is when inspiration strikes, allowing thoughts percolate up from the unconscious and become my art, or poetry or prayers. 3. What's your style? Abstract, pictorial, surface design, whole cloth, etc. I do all of these. My main works are digital, collage, and surface design; sometimes works will feature one of these styles but often they blend together. 4. How long have you been a quilt maker/fiber artist? I took to fiber in High School- making my own clothes and prom dresses, graduating with a BS in Home Economics from collage. I started the artistic part of my fiber-oriented career with batik soft sculpture in the late 1970’s. When I moved to NH and joined a quilt guild I mastered hand piecing, and quilting, slowing processing back into doing whatever I chose to do. I embrace the pioneering fiber art movement of today. 5. Do you listen to music when you make art? what kind? Music comes and goes. Sometimes, I need it to provide distraction from outside sounds, other times I need the meditative, joyous, blues, even rock music to bring in certain flow. It all depends on my state of mind and where I am in the creative process. Often I work in complete silence because my inner muse is whispering. 6. What do you do when you are blocked creatively? I haven’t been blocked in years, especially now- I almost feel like I’m bent over backwards on top of a rocket, watching the inspirations wash over me as I fly skyward. However, that is not to say I haven’t been blocked. I find that is time to step back and feed the soul by walking on a beach, in the woods or sitting by a lake; or taking myself to museums or galleries. I journal; I make hand bound books where drawings are kept, inspirational quotes and clippings. I can be inspired by a well put phrase or poem in addition to the visual. 7. Do you teach? What's your favorite part about teaching? I have taught for at least 20 years at a very easy pace. I kept this slow allowing plenty of studio time. I have ‘put myself out there’ this year and will do so for a while until I need to retreat. I love interacting with fellow fiber fellows. The energy is greater than the whole and I always learn from my students. 8. Are there artistic endeavors that you have yet to do? Yes, I am by no means without plans. This is such a vibrant green growing thing. 9. How do you balance your family life and art? That is a challenge that many female artists face. I chose to have a family and for many years worked in bits and pieces snatching time here and there. After the children left home, I had a difficult time adjusting to longer working hours. Now I can work and not know the passage of time. This is a gift I honor. Art Quilt Elements 2010 again! Wonderful show of cutting edge work. I was proud to be in attendance. Here's some press and vid's about the show. We received great press from the Philadelphia Inquirer in the Friday Weekend section that should bring in many more visitors. And a visitor named Mariee has be making multiple postings on her blog about the various pieces in the exhibition in terms of Texture, Print, and Color. Finally, above, photo of all the artists who made it to the opening. I'm on far left- (hmmm). and a personal note from John Hopper!! 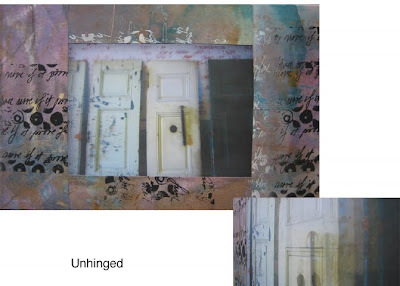 "Just to say how impressed I was with your entry into the ArtQuilt Elements 2010 exhibition. I came across Perspective with Trees when the organizers asked me to help publicise the event. I must admit that it is my favourite and I wish all the success you so richly deserve." I have just attended the SAQA Symposium at the Wayne Art Center in PA. This cutting edge show encourages joyful endeavors into the wide variety of art quilting- from collage, free form, digital and surface design- the show is sure to stimulate the creative juices. Folks were warm and pleasant- all kindred spirits. jury process with a panel discussion of jurors Jason Pollen, Robin Schwab and Deborah Warner. I particularly enjoy Jason's effervescent, embracing spirit. followed by a short mentoring session by attending artists. some whole and some details. It is always so much fun to see one's work displayed in it's new location. I love it when folks send me pictures too. I was fortunate to be able to see 3 works in their new homes. A moment alone. Manipulated digital image of water. Original image printed on archival digital canvas, bordered in hand painted and surface designed fabrics. 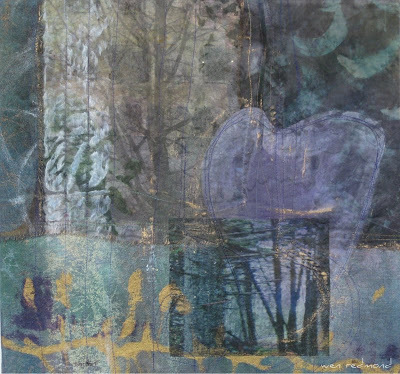 A section of the image printed on transparent silk organza, providing a holographic effect. New Bridge on the Charles, Dedham Ma for directions. Level 1, North RSU, Wing 7115 and on Level 1, South West entry corridor. fiber folks at Quilter's Connection Quilt Guild, Watertown MA. They hosted me for a back to back Piecing in the Flow Workshops on Saturday and Sunday, and a Presentation at their Monday night guild meeting. Here are some shots of those events. I am shocked and very pleased to find out 5 of my pieces will be in new 1000 Artisan Textiles book!